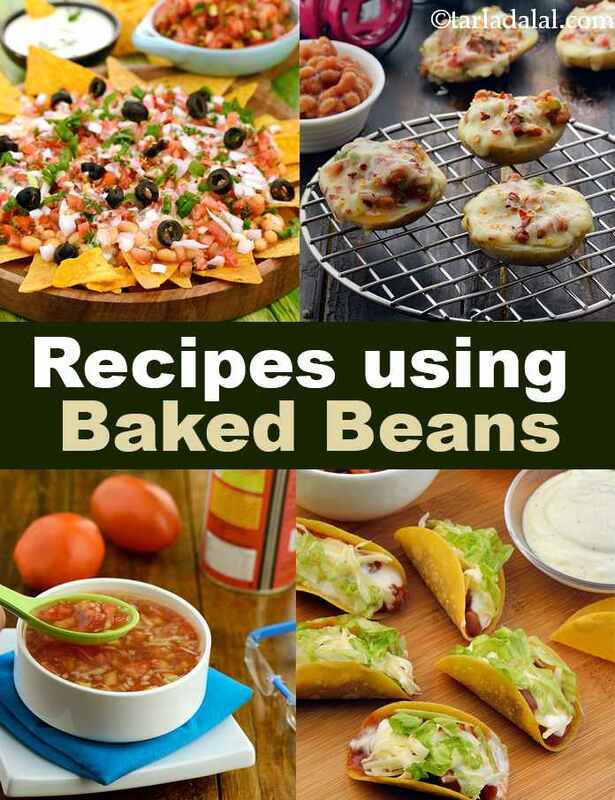 baked beans recipe collection. vegetarian bakend beans recipes. Baked Beans are haricot beans that are baked or stewed in a tomato sauce and mostly eaten for breakfast. They make for a staple in American dishes but are now being used all. The sauce of the baked beans is slightly sweetish, due to the use of a little brown sugar. Baked beans are generally used in England and Ireland as a breakfast item and hence proudly form part of the "English Breakfast" that is now served all over the world. You can make baked beans or buy the more popular canned ones which can be eaten cold or hot as they are already cooked. Apart from just eating plain baked beans on toast, you can experiment by adding them to various fusion vegetarian recipes that will give your recipes a twist. Baked beans make a classic breakfast item and what helps is that they are delicious! They can be directly taken out of the can, put on toast and had but I prefer to jazz it up and eat my kind of Beans on Toast. Here, the baked beans are cooked with garlic, spring onions and capsicum, and spread on a hot, buttered toast. Kids are more difficult to feed, so it's always preferable to make something fun! Stuffed Baked Beans Tartlets are exactly that! Bread baked into tiny tarts, stuffed with beans and cheese is a perfect to the day! Another feast is Pancakes stuffed with Baked Beans and Vegetables, served with a luscious white sauce that will be loved by all. Since baked beans are already a dish in itself, not many think of adding it to soups. A spicy soup for a perfect winter day, Tomato and Bean soup is a tangy and sweet soup that is soothing and comforting. This is the most basic version of the soup but you can add more vegetables like cabbage, carrots and more! This can of goodness can be turned into a delicious Baked Beans dip as well for parties! The ultimate snacks with beans are Tacos! Mini taco shells are stuffed with beans, sour cream, lettuce and leaves is an easy to prepare snack that is perfect for night where you are hosting a lot of guests. Place some beans on crackers and maggi and you'll get a snack that kids will devour in a minute - Maggi and Baked Beans on Crackers. Who says you can only have baked beans for breakfast? There are numerous fun dishes that can be made, not only for the taste but also for the sake of convenience as a can of baked beans replaces the effort to soak and cook regular beans. Baked Beans Veg Cannelloni is a tube of pasta stuffed with delectable beans served with a side of garlic bread, the perfect crispy side! Beans are used a lot in Mexican Cuisine which is why they make the perfect addition to Mexican sizzler! Simply mixing beans with cheese, chili and stuffing them in fresh quesadillas gives rise to the perfect main course – Chilli Bean Quesadilla! Have this with a little dollop of sour cream and sprinkling of green onions, it will tie the dish together! Hope you like this collection of Vegetarian Baked Beans Recipes! It is good to have a stock of baked beans in the refrigerator because they go well with most sandwiches and burgers, not to forget baked potatoes too. Bean and cheese burgers are simple and easy to make as they do not require a patty. You can fix yourself one anytime you feel hungry. A dish with proud mediterranean origins, this soup is a winter warmer to be served with warm crusty bread and if you like, a slice of cheese. The addition of cream to the soup balances the acidic taste of the tomatoes. Cabbage, carrots and onions combine here in a tomato base to make this heart-warming soup. Baked beans add on to the flavor and crunch in this soup.